Agile.net Copy Protection requires that you add a reference to AgileDotNet.Licensing.dll assembly and add additional code to facilitate licensing with your software. To seamlessly integrate existing projects with Agile.net Copy Protection use the project wizard, the Project Wizard is used to add licensing protection to Visual Studio projects. The Project Wizard will create a public/private key pair that will be used to protect your software, it also adds a reference to the appropriate version of the Agile.NET.Licensing.dll assembly and a code sample demonstrating how license validation code may look like. To run the Project Wizard click the 'Protect VS.NET Project' wizard button shown on the main ribbon after you select the license tab. Select the project file you'd like to set up licensing with. 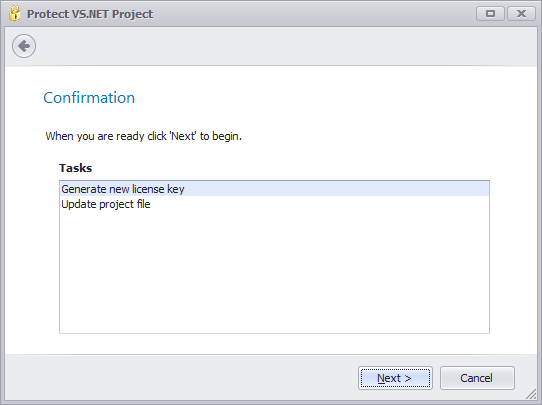 The Create license keys page lets you select the keys to use when protecting the Visual Studio .NET Project. To create new keys for the project select the first option. Enter a name for the keys, this value is informational only and is not used in any way to validate the license. Select the second option if you have already created keys for the project. The license keys will be stored in the project file (.cls extension) after you save the project. The wizard is ready to prepare your project file, press next and then finish. 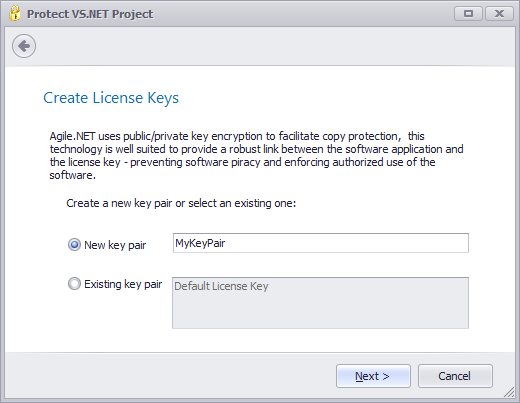 Include the public license key file within your project file (AgileDotNetPublicKey.cs). 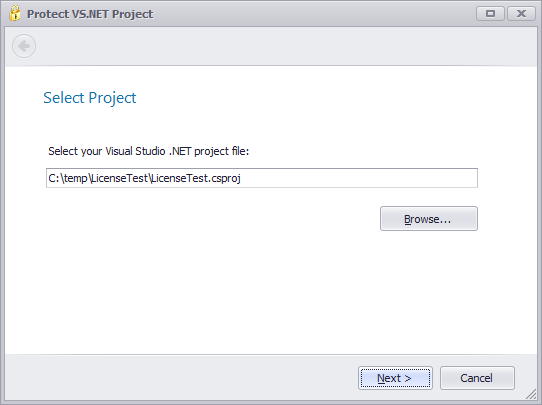 Add a reference to AgileDotNet.Licensing assembly. Add a code template you can use to start integrating your solution with our licensing module (AgileDotNetLicenseValidation.cs). Now you project is ready to work with Agile.net Copy Protection module, open the solution file and add calls to LicenseProvider.Valdiate(this.GetType(), this) method in each of the classes that you want to protect.